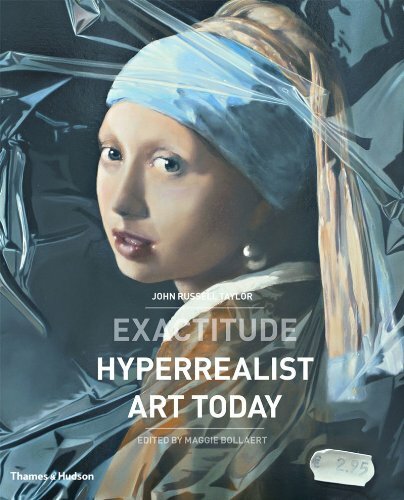 If you don't have the three Photorealism books by Louis Meisel 'Exactitude' will sort of bring you up to date. Meisel's last book came out in 2002 and it firmly related art of the title: Photorealism at the Millenium. Since then, though, the genre has moved on and to judge by the subject matter of the artists in these pages Photorealism doesn't really capture the feel so Clive Head used the term Exactiude. The precision and clarity is still evident but one of the main ingredients of Photorealism was capturing American commonplace, many artists in these pages have moved completely away from this. The twenty-seven painters in the book (with ten from north America and ten from Britain) are arranged alphabetically kicking off with John Beader. One of the first generation Photorealists, although Meisel, in his first book, included him in the `Artists related to Photorealism' section. Here he is, still creating wonderful diner paintings full of sparkle and wit. To show how things have moved on the next artist is Paul Beliveau. So completely different from Baeder in subject matter: close-ups of book spines. Beliveau like other artists in the book: Pedro Campos; Cynthia Poole; Cesar Santander have chosen to include plenty of print typography in their work, which, to my mind, is probably the hardest sort of painting to achieve perfection, especially when painted on canvas. Duplicate letters have to look exactly the same, something Santander with his close-ups of tin boxes seems to achieve with ease. Wonderful to look at but I thought they seemed to more technical exercises than creative. The subject matter chosen by the book's painters is, mostly, either exteriors or still life close-ups. Exceptions are David Ligare who returns to the classical past with his mythological content and the fantasy architectural content of Carl Laubin. Simon Hennessey is the only portrait painter in the book concentrating on eyes. City and industrial landscapes get a good showing from David Finnegan, Clive Head, Ben Johnson, Christian Marsh, Robert Neffson, Francisco Rangel and Steve Whitehead. The paint of choice is oil or acrylic for everyone except for Andrew Holmes who uses colored pencils on paper (I wonder if this actually paint in a pencil) and achieves some incredible finishes on his trucks and mirror looking tankers. This is a thick chunky book (check out the Product Description) with 550 paintings. Another reviewer has commented on the reproduction in relation to the Meisel books. His three and this one are all printed with a 175 screen on reasonable matt art paper in each case. My impression is that this book is slightly lighter in printing quality and lacks true blacks especially when compared to 'Photorealism at the Millennium' title. Print relies heavily on the quality of the originals, either digital or transparencies. Overall I thought this was a fascinating look at realist painting with enough variation of subject matter to appeal to anyone interested contemporary art.